Bland, uneventful and predictable. Made for fans of "Dungeons & Dragons" and other terrible epic fantasy quests. Season of the Witch is one of those bad made-for-TV movies that somehow makes its way to the big screen. Although the story offers potentially cool and unique scenarios, it blows it with each one. Apparently, during the crusades there was a large outbreak of witches across Europe – enough so that the time can be called “the season of the witch.” The opening scene shows how these evil witches were treated, dealt with and how much of a menacing trouble they could be. 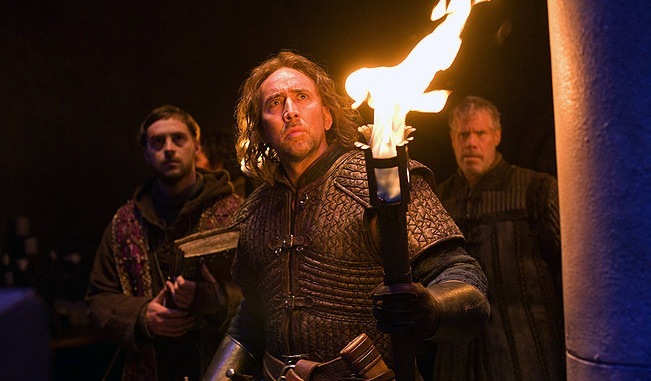 While the villages was busy taking care of their witch infestations, two noble and brave brothers-in-war, Behmen (Nicholas Cage, The Sorcerer’s Apprentice) and Felson (Ron Pearlman, Hellboy), were fighting grandiose battles in the name of God. After being led by their Christian captain to unknowingly kill unarmed women and children, Behmen and Felson went AWOL. Along the way home, Behmen and Felson were recognized, captured and commissioned to transport a witch guilty of cursing a village with the plague to a distance monk stronghold in return for the forgiveness of their sins. Seeking to cleanse themselves of the innocent blood they took, Behmen and Felson accept the offer. Shortly into their treacherous journey, they quickly realize how powerful the young witch really is – she sees each company members’ weakness and uses it against them, turning this errand into a feat more difficult than any battle fought in Jerusalem. The sad part is that everything described up to this point doesn’t sound half bad. The execution of this story causes each good idea to be wasted. The witch only uses her power to use others’ weaknesses only once – she simply drops it and never does it again. After that, the supposedly intense moments come from regurgitations of old period pieces: there is the canyon bridge with rotted boards and frayed ropes, the obligatory attack by a ravenous pack of wolves in a foggy forest, etc. If you are tempted to see Season of the Witch, don’t. Please don’t. Do yourself a favor and Redbox or Netflix some other bad unheard-of movie of the same genre to save yourself the money.